Find out what's new on the Seventh Moon. The new design is more compact and easier to edit. There is also a new blog, http://seventhmoon3.tripod.com/Discourse/. We have a new pope who seems to have stepped right into St. Malachy's predictions. 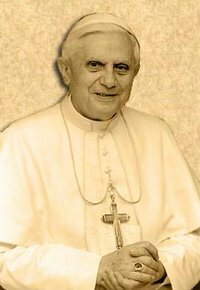 "The Glory of the Olives" chose the name Benedict XVI - after the founder of the Benedictine order which is also known as "The Olivetans." Suggestions? Check out the Contact page.